MEVN Tutorial: The comprehensive tutorial on MongoDB, Express, Vue.js 2, Node.js (MEVN) and SocketIO Chat Application. 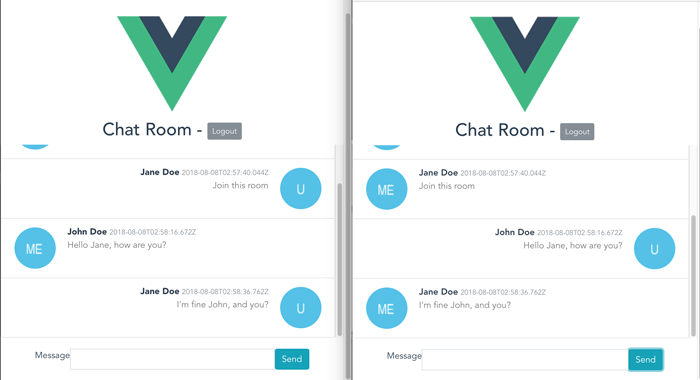 Previously we have a tutorial on build chat application using MEAN Stack, now we build this chat application using MEVN (MongoDB, Express.js, Vue.js 2, Node.js) Stack. The different just now we use Vue.js 2 and Axios, we keep using MongoDB, Node.js, Express, and Socket.io. The scenario is very simple, just the rooms and the chats for each room. The first page will show the list of the rooms. After the user enters the room and fills the username or nickname then the user enters the chats with other users. We assume that you have already installed Node.js and able to run Node.js command line (Windows) or `npm` on the terminal (MAC/Linux). Open the terminal or Node command line then type this command to install `vue-cli`. That where we start the tutorial. We will create the MEVN stack Chat application using `vue-cli`. To create a new Vue.js 2 application using `vue-cli` simply type this command from terminal or Node command line. There will be a lot of questions, just leave it as default by always pressing enter key. Next, go to the newly created Vue.js project folder then install all default required modules by type this command. 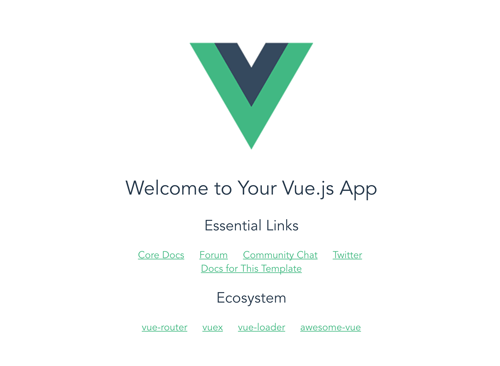 Now, check the Vue.js 2 application by running the application using this command. Open your browser then go to `localhost:8080` and you should see this page when everything still on the track. Close the running Vue.js 2 app first by press `ctrl+c` then type this command for adding Express.js modules and its dependencies. Next, create a new folder called `bin` then add a file called `www` on the root of the Vue.js project folder. Open and edit `www` file then add this lines of codes. Next, change the default server what run by `npm` command. Open and edit `package.json` then replace `start` value inside `scripts`. Next, create `app.js` in the root of project folder. Open and edit `app.js` then add this lines of codes. Next, create routes folder then create routes file for the room and chat. Open and edit `routes/room.js` file then add this lines of codes. Do the same way with `routes/chat.js`. Now, run the server using this command. You will see the previous Vue.js landing page when you point your browser to `http://localhost:3000`. When you change the address to `http://localhost:3000/api/room` or `http://localhost:3000/api/chat` you will see this page. Next, open and edit `models/Room.js` then add this lines of codes. Open and edit `models/Chat.js` then add this lines of codes. Open and edit again `routes/room.js` then replace all codes with this. Open and edit again `routes/chat.js` then replace all codes with this. Now, let's populate Room collection with initial data that sent from RESTful API. Run this command to populate it. Now, it's time for Vue.js 2 or front end part. First, create or add the component of the room list, add a room, join a room, chat room. Create all of those files into the components folder. Now, open and edit `src/router/index.js` then add the import for all above new components. For UI or styling, we are using Bootstrap Vue, to install it type this command on the terminal. Open and edit `src/main.js` then add the imports for Bootstrap-Vue. Next, we are using Axio for accessing RESTful API that provided by Express.js. To install it, in the terminal type this command. 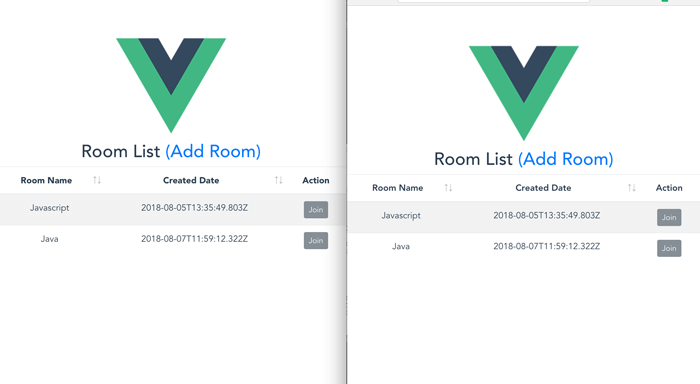 Now, open and edit `src/components/RoomList.vue` then add this lines of codes. There are template and script in one file. The template block contains HTML tags. Script block contains variables, page lifecycle and methods or functions. Now, open and edit `src/components/AddRoom.vue` then add this lines of codes. That code contains the template for room form, the script that contains Vue.js 2 codes for hold room model and methods for saving room to RESTful API. Now, open and edit `src/components/JoinRoom.vue` then add this lines of codes. That code contains the template for join room form, the script that contains Vue.js 2 codes for hold chat model and methods for saving room to RESTful API. That code contains the template of the main chat application consist of chat list and sends message form. Previous steps show you a regular and non-realtime transaction chat application. Now, we will make it real-time by using Socket.io. First, install `socket.io` module by type this command. Next, open and edit `routes/chat.js` then declare the Socket IO and `http` module. Add this lines of codes for Socket IO functions. In that code, we are running Socket.io to listen for 'save-message' that emitted from the client and emit 'new-message' to the clients. Next, open and edit `src/components/JoinRoom.vue` then add this import. Add Socket IO `emit` function after successful join room. Next, open and edit `src/components/ChatRoom.vue` then add this imports and use as Vue module. Add this Socket IO `on` function to `created` method. Add Logout function inside methods and add Socket IO `emit` method in the POST response. Finally, to make Chat list always scroll to the bottom of Chat element add install this module. That module already imported and declared above. Next, add to the Chat element. To run this MEVN (Vue.js 2) Chat Application locally, make sure MongoDB service is running. Type this command to build the Vue.js 2 application then run the Express.js application. Next, open the different browser (ex: Chrome and Firefox) then go to the `localhost:3000` on both of the browsers. You will see this page and you can start Chat. That it's, the MongoDB, Express, Vue.js 2, Node.js (MEVN) and SocketIO Chat App. You can find the full working source code on our GitHub.